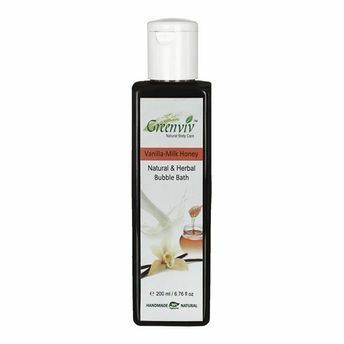 Just soak your body in this luxurious Greenviv Natural Milk & Honey Bubble Bath. With Vanilla scent, this bubble bath stimulates your senses and milk & honey nourish your skin to the fullest. This is a natural cleanser & moisturizer that is made with natural Oils, herbs, extracts & essential oils to deeply cleanse & nourish skin with refreshing bathing experience.